The court granted defendant's motion to exclude the opinions of plaintiff's compensatory damages expert regarding the "price effect" on a reasonable royalty. "[Plaintiff's expert] attributes more than half of his reasonable royalty rate, $71, to what he calls the 'price effect.' As [he] describes it, 'the pricing effect is based on [plaintiff's] initial and subsequent pricing being lower than its intended pricing. In the event [plaintiff] could have sold its valves at the intended higher prices, and [it] expected higher prices without [defendant] in the market, these otherwise higher prices are additional profits [plaintiff] would have been licensing out and are attributable to the Accused Products.'. . . [Plaintiff's expert] does not have the proper foundation to conclude that [plaintiff] would have made every sale that [defendant] did at its intended higher price. . . . [T]he 'price effect' is twice as large as the value that [he] attributes to the patented product. [Plaintiff's expert] is attempting to use the label 'price effect' to cover what appears to be lost profits. . . . For these reasons, [the expert] cannot include the 'price effect' in his reasonable royalty analysis." The court granted plaintiff's motion in limine to preclude reference to a pending inter partes review proceeding. "Plaintiff moves the Court to preclude Defendants from making any reference to the pending inter partes review proceeding on the [patent-in-suit], arguing that reference to incomplete inter partes review is purely speculative and would be highly prejudicial to Plaintiff. Defendants argue that this evidence is probative of Defendants’ defenses, and, any prejudicial effect could be alleviated by jury instructions. The Court finds that the evidence would be highly prejudicial to Plaintiff and confusing to the jury, and Defendants are thus precluded from offering evidence of the pending inter partes review process." The court denied defendant's motion for summary judgment that the entire market value rule did not apply and that plaintiff was required to apportion damages. "[T]rying to prove but-for lost profits in a case involving devices that may include dozens of distinct and possibly separately patented products can . . . be 'an exceedingly difficult' task, fraught with the risk of total failure. And a failure to apportion between asserted patents bears its own risks in those circumstances. Defendant . . . argues that . . . Plaintiff will fail. Plaintiff responds that the bid requirements of the major customers for whose business the parties compete, and Defendant’s marketing during that competition, show that the infringement was the but-for cause of the lost sales. . . . Defendant’s argument that Plaintiff inappropriately applies the entire market value is therefore not a search for a smaller physical unit or a request to exclude a follow-on sale, but a demand that Plaintiff show how much of its profit results from the patented features. Plaintiff has elected not to make that general showing, but instead seeks to convince the jury that in this particular commercial context, it would have made the sale but for the infringement. While the jury might not agree, Plaintiff has provided enough evidence in support of that theory to avoid summary judgment." In response to feedback from the Court’s Patent Study Group, the district judge advised the parties that it would "change the way [the court] process[es] patent cases." "Any non-ANDA patent case that has had a scheduling order entered in the past six months will presumptively be switching to the new process, keeping to the extent possible the pretrial and trial dates, but probably having to add and/or change other status and hearing dates. I ask that you confer verbally with opposing counsel consistent with my new orders, which expand upon your responsibilities under Fed. R. Civ. P. 26(f) and 16, in order to conform your current order into the new format prior to meeting with me. . . . Clearly . . . the very nature of patent litigation has changed, and the message sent by virtually all participants in the PSG was that my process could better adjust to those changes." The court denied defendant's motion to dismiss plaintiff's direct infringement claim for failure to state a claim. "[Defendant] asserts that [plaintiff's] complaint lacks factual allegations that [defendant] 'controls' or 'uses' all portions of the claimed invention or that [defendant] combines all claimed elements necessary to 'make' the system. [Defendant] further argues that while Form 18 is adequate in complaints of direct infringement of method patent claims, it does not satisfy the pleading standard for system patent claims. The sole case [defendant] cites to support a heightened pleading standard for systems claims is Centillion Data Systems, LLC v. Qwest Communications Int’l, Inc., 631 F.3d 1279 (Fed. Cir. 2011). However, in Centillion, the Federal Circuit was considering an appeal of summary judgment, not a motion to dismiss. Further, while Centillion did define the standard for what constitutes 'use' of a system claim, there is nothing therein to suggest the Federal Circuit intended to raise the pleading standard for system claims. Accordingly, this Court will not adopt the higher standards [defendant] advocates." The court denied without prejudice the parties' various motions to strike expert reports and exclude expert testimony. "The approximate 500 pages of paper constituting these motions, responses, sur-responses, and sur-sur-responses is an indication that the parties wish to pre-try this case by lengthy and complicated motions, necessitating the reading of depositions by the judge not familiar with the factual allegations and issues to be determined at trial. Unfortunately, this is not a docket where it is possible. In addition, it is improbable to accurately make admissibility determinations abstractly without the benefit of hearing the testimony in the trial. Each side (yes, 'side') will receive eighteen hours in which to present their cases to the jury beginning with opening statement and ending with the closing of the evidence. . . . If a party wishes to make a Daubert objection, the Court will accommodate that party, listen to the testimony of the witness and the argument of counsel, and make a determination as to admissibility of the witness's testimony, in whole or in part. If the objection is overruled, the time taken for that process outside the presence of the jury will be subtracted from the eighteen hours of time of the objector(s). If the objection is sustained, the time taken will be subtracted from the presenter of the witness's eighteen hours of presentation. If the parties want to simply cross-examine expert witnesses for the consumption of their eighteen hours, that is their business." The court granted defendant's renewed motion to dismiss plaintiff's infringement action for lack of personal jurisdiction. "[Defendant] knows, with reasonable certainty, that its chips will end up in the United States marketplace, including, by inference, in Texas. . . . [N]o evidence demonstrates that any of [defendant's] conduct or activity is any more specifically directed at this state than it is at the North American market as a whole. Critically, none of the deposition testimony presented by [plaintiff] shows any evidence to suggest that [defendant] purposefully targets its business conduct specifically at Texas or that the substantial Texas market for televisions is of any particular focus. A rational belief that a component or product will eventually end up in a particular state -- even if that belief amounts to a substantial certainty -- does not, by itself, amount to purposeful conduct nor 'manifest an intention to submit to the power of a sovereign.' . . . Although . . . [defendant] knowingly supplies parts for televisions ultimately destined for the United States, the court finds no direct conduct, connection, or purposeful availment of Texas's laws that justifies the exercise of personal jurisdiction in Texas, as opposed to any other state in the union. After careful search for any evidence showing an articulable connection to this state, the facts of this case simply do not suffice to establish the minimum contacts required to exercise jurisdiction over [defendant] in Texas under any current theory of specific personal jurisdiction." Following the case management conference, the court issued a "License Production Order" requiring plaintiff to produce all license agreements covering the patents-in-suit. "If plaintiff is seeking a reasonable royalty, in whole or as part of its damages, [in 4 weeks], plaintiff will produce to defendants all license agreements it has entered into, or now holds as a successor-in-interest to a prior licensor, covering the patents at issue, whether entered into before or after the start of litigation (i.e., licenses arising from settlement of litigation). The production of licenses is subject to the highest level of confidentiality (Attorneys’ Eyes Only) unless the plaintiff designates them otherwise." The court granted defendants' motion to dismiss for improper joinder where plaintiff alleged that "[t]he accused products are compliant with [two standards] and/or incorporate [two] chip sets for wireless communication, and/or incorporate [two] sets for wireless communication, and/or the equivalents of such chip sets.” "The Court is not persuaded [plaintiff's] pleading, with its deliberate use of the ambiguous words 'and/or,' satisfies [its] obligation under [35 U.S.C. § 299] of alleging the Defendants indeed make, use, import, offer to sell or sell the same allegedly infringing product or process. As noted by [movants], the Amended Complaint does not allege any commonality between any [movants'] accused product and any [other defendant's] accused product. And merely alleging the accused products have [the same] chip sets in them is insufficient to support joinder, as the incorporation of a common component into different accused products does not satisfy section 299’s requirement that the Defendants provide the same accused product or process." The magistrate judge recommended denying a motion by plaintiff's competitor to intervene and participate in claim construction. "While it is true that [movant] . . . has been sued by [plaintiff in another action], and that action involves three of the same patents implicated in this action, any ruling by the court in this matter concerning claim construction will not be binding in that case. . . . If intervention were permitted under such circumstances, it seems likely that the courts would be inundated with requests by accused infringers, or even potentially those fearing infringement litigation, to be heard regarding the question of claim construction. To permit such a practice would wreak havoc on the courts and further complicate already expensive and complex patent infringement litigation." The court granted defendant's motion for a protective order precluding plaintiff's proposed expert from reviewing defendant's confidential information. "[One proposed expert] is an active consultant in the field at issue. In the very recent past, he has worked for several of [defendant's] competitors, and there has been no representation or agreement that he will not do so again in the very near future. [Defendant] points out several ways in which the information to which he would be exposed as an expert in this case could influence his work as a consultant on patent licensing, reverse engineering, and portfolio management, even if he were to make his best efforts to cabin the information off in his mind, and the court finds these concerns persuasive. Furthermore, despite the concerns raised by [defendant], [plaintiff] has not identified any unique qualifications or knowledge that make [him] better suited than any other expert to serve." The court denied plaintiff's motion for attorneys’ fees under 35 U.S.C. § 285 following a joint motion for dismissal. Although the court found the case to be exceptional, plaintiff did not submit adequate and timely evidence of fees related to defendant's counterclaims. "[Plaintiff] has not met its burden of substantiating the hours worked here. The materials [plaintiff] submitted in justification for attorney fees appear to include all work done by counsel after [defendant] submitted its counterclaims. The materials fail to distinguish between the hours incurred for work done on the counterclaims and hours incurred as a result of [plaintiff's] noninfringement or invalidity claims under its Complaint for Declaratory Judgment. . . . As such, an award of attorney fees in this case would require speculation. . . . The Court declines to invite untimely record keeping submissions or belated explanations for [plaintiff's] failure to fulfill its current burden." The court granted defendant's renewed motion to exclude plaintiff's damages expert's multivariate hedonic regression analysis. "In assessing the appropriateness of the benchmark rates against the Georgia-Pacific factors, [the expert] . . . used multivariate hedonic regression to 'estimate the value of the accused feature’s contribution to the overall prices realized by [defendant] on the 5 Accused Products.' . . . Even assuming that hedonic regression analysis could properly be used to calculate the value of the accused feature, I conclude that [plaintiff's expert's] methodology relies on arbitrary assumptions that have no basis in the facts of this case or hedonic analysis in general. [His] attribution of equal value to all 19 RAS features is not based on any theory that meets the Daubert criteria of verifiability, peer review or publication, an acceptable error rate, or general acceptance in the scientific community. Indeed, [he] admitted that he could not separately estimate the value of the accused feature because all 19 RAS features were present in the same processor models.. . . . Utilizing guesswork is precisely what [plaintiff] is attempting to do here with [its expert's] guess as to the value of the accused feature in connection with his hedonic analysis. . . . [The expert's] opinion that 2.2% of the price of the accused products is attributable to the 8 accused feature lacks the 'valid scientific connection to the pertinent inquiry' that is required 'as a precondition to admissibility' under Rule 702." The Board terminated inter partes review because the challenged claims were indefinite. As a result, the Board was "unable to reach a determination of the alleged grounds of unpatentablilty over prior art." "[T]he scope of the claims of the . . . patent cannot be determined without speculation. Consequently, the differences between the claimed invention and the prior art cannot be determined. . . . [The patent owner] urges us to conduct the prior art analysis based on only the functional recitation of the means-plus-function element. We decline to do so. . . . [T]hat is contrary to the requirements of both 35 U.S.C. § 112, sixth paragraph, and 35 U.S.C. § 103. The obviousness determination is directed to the claimed invention as a whole, not to any partial invention that does not include all of the requirements of the claim. . . . Without ascertaining the proper claim scope, we cannot conduct a necessary factual inquiry for determining obviousness." The court granted defendant's motion to dismiss and rejected the argument that compliance with Form 18 was sufficient to state a claim for direct infringement. "[Plaintiff] . . . assert[s] that its case is only for direct infringement and that complaints presenting such claims . . . need only comply with Form 18 . . . [T]o exempt patent complaints from the requirements of [Bell Atlantic v. Twombly, 550 U.S. 544 (2007)] and [Ashcroft v. Iqbal, 556 U.S. 662 (2009)] is to ignore a fundamental rationale that underpins those decisions. . . . [B]efore filing a complaint, counsel must ascertain exactly what claims should alleged to be infringed and how they are infringed. That can be done with brevity and clarity if counsel know at the outset their theories of infringement and what can, and cannot, be said about allegedly infringing conduct. . . . Indeed, it is high time that counsel in patent cases do all of that work before filing a complaint. . . . The current practice is to file a Form 18 complaint and then, using claim charts, prior art charts, discovery, and motions, to pare claims that ought not to have been brought or that cannot withstand careful scrutiny. That process has proven to be an increasingly expensive proposition for the parties and one that takes a tremendous toll on already strained judicial resources." Following a jury trial, the court granted both plaintiffs' motion for a permanent injunction; both plaintiffs were irreparably harmed even though one did not practice the patent-in-suit. "[One plaintiff] directly competes with [defendant] for the same customers in the OEM market. . . . [A second plaintiff's] sales are bound at the hip to [the first plaintiff's] sales, such that when [the first's] sales to OEMs lag, [the second] feels the pain. Thus, even though [the second plaintiff] does not practice the [patent], its tire repair kits directly compete with [defendant's] infringing repair kits. 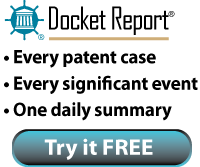 The only significant dispute here is whether the patentee [the second plaintiff] can be irreparably harmed by infringing sales even though it competes with [defendant] through an intermediary ([the first plaintiff]). . . . [I]ndirect competition generally can support a finding of irreparable harm. Here, it is clear that [the second plaintiff] and [defendant] compete for the same market – even if indirectly. . . . [F]ewer sales for [the first plaintiff] mean fewer sales for [the second]. [The second plaintiff] thus has lost market share to [defendant], favoring a finding of irreparable injury." The court granted in part plaintiff's motion for an ongoing royalty on defendant's accused secure video products and awarded an ongoing royalty at approximately double the verdict's implied royalty rate. "While [defendant] has taken steps to mitigate its infringement, [it] grossly misrepresented its ability to implement a non-infringing alternative to the jury. The huge disparity between [defendant's] position at trial and [its] position post-judgment also warrants increasing the implied royalty rate. In light of the changed circumstances, the reasonable royalty rate should be increased by 25%. . . . [Defendant's] ongoing willful infringement must also be considered. . . . While [defendant] contends it is not a willful infringer because it has a good faith belief that the patents-in-suit are invalid and that it does not infringe, the jury’s verdict and this Court’s judgment do not support [defendant's] belief. . . .While [it] has taken steps to implement non-infringing alternatives, [defendant] has not ceased all infringement. Considering four factors favor enhancing the implied royalty rate, the ongoing royalty rate is increased 50% to 0.98%." The court granted defendant's motion to stay pending inter partes review. Although the case was eight years old and had been stayed four years pending reexamination, the early stage of the case, potential simplification of issues, and lack of undue prejudice weighed in favor of a stay. "To date, no claim construction hearing or trial date has been set. Moreover, the parties have not engaged in any significant discovery. While the Court appreciates that this case has been pending for several years, this fact alone does not negate the reality that a trial of this matter could be in distant view. As such, the Court finds that this case is still in early stages of litigation and well-positioned for a stay. . . . Now that the PTO has instituted review on all claims of the [patent-in-suit], simplification of the issues is more likely. . . . The gravamen of [plaintiff's] opposition is that this case was previously stayed for four years pending the ex parte reexamination. Any further delay, [plaintiff] argues, is inappropriate. The Court disagrees." The court granted plaintiff's motion to disqualify defense counsel who had served as lead patent counsel for a company that merged with plaintiff. "[F]or purposes of Rule 3-310(E), [plaintiff] is [defense counsel's] former client. By virtue of [the] merger with [plaintiff], [plaintiff] is now the holder of the attorney-client privilege relating to [defense counsel's] representation of [the company that merged with plaintiff]. . . . [Defense counsel's] extensive and long-term representation of [that company] unquestionably created an attorney-client relationship between them. [The] subsequent merger with [plaintiff] did not extinguish that relationship. [Defense counsel's] argument to the contrary 'exalts substance over form,' and is contrary to purposes of the attorney-client relationship." In a final written decision, the Board denied the patent owner's motion to amend claims on the grounds that the motion failed to demonstrate the patentability of the substitute claims over the prior art. "[The expert's] testimony . . . is limited to anticipation issues, and fails to demonstrate sufficiently that the substitute claims are nonobvious. . . . Although [he] concludes that the substitute claims would not have been obvious to one of ordinary skill in the art, [his] analysis merely discusses how each cited prior art reference individually does not disclose the features added in the substitute claim. Such a patentability analysis is insufficient to demonstrate nonobviousness, because an analysis of whether the subject matter of a claim would have been obvious 'need not seek out precise teachings direct to the specific subject matter of the challenged claim, for a court can take account of the inferences and creative steps that a person of ordinary skill in the art would employ.'" The court conditionally granted a non-petitioner defendant's motion to stay pending inter partes review contingent upon defendants' agreement to be subject to "weaker" statutory estoppel due to the defendant's non-involvement with the IPR proceedings. "[B]ecause [defendant] is not one of the IPR petitioners, [it] would not be precluded under 35 U.S.C. § 315(e)(2) from reasserting invalidity contentions rejected by the PTO. . . . If [defendant] and IPR petitioners communicate on strategy, [defendant] should be bound by the full statutory estoppel provision. If, however, [defendant] has no input on the IPR strategy, it should not be precluded from raising arguments that could have been raised in the IPR proceedings. At the hearing, [defendant] represented to the court that it did not assist the IPR petitioners with any prior art search, that it took no part in drafting the IPR petitions, and that it is not in communication with the IPR petitioners concerning the IPR. . . . [R]equiring [defendant] to submit to a weaker estoppel foreclosing it from relitigating claims made and finally determined in the IPR proceedings is necessary to effect the PTO’s interest in protecting the integrity of PTO proceedings and in preventing parties from having a 'second bite at the apple.' The court thus conditions the stay on [defendant's] agreement to be estopped only from asserting any invalidity contention that was actually raised and finally adjudicated in the IPR proceedings." The court denied defendants' motion to stay pending an interlocutory appeal of the court's earlier decision to deny a motion to stay pending CBM review. "Defendants have failed to cite, and this Court is unaware of, any authority holding that attending a Markman hearing in the middle of a co-pending reexamination proceeding constitutes 'irreparable injury.'. . . To the extent any further statements of Plaintiff’s [during CBM review] or amendments to claims may affect the Court’s claim construction, such is fully remediable with supplemental claim constructions. . . . This Court is mindful that the Federal Circuit, in reviewing whether or not this case should be stayed, is tasked with ensuring that AIA § 18(b) is 'consistently applied across cases and across the various district courts.'. . . However, the Federal Circuit’s decision-making does not depend on whether the proceedings below are stayed pending appeal. Defendants have failed to demonstrate how this Court’s denial of a stay pending interlocutory appeal would impede, in any way, the Federal Circuit’s interest in the consistent application of AIA § 18(b) across the nation’s district courts."